How many students are not taking any of the three subjects? 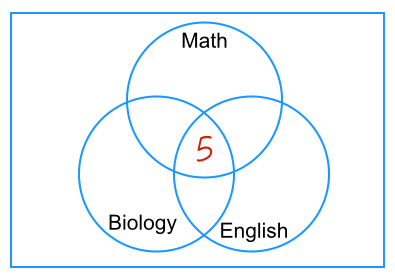 How many students take Math, but not Biology or English? How many students take Math and English, but not Biology? As we have done in Solving Venn Diagram Problems Part 1, we started with the overlapping circles. In this problem, we have four regions which overlap. The the easiest strategy is to start at the center, the part where the three circles overlap. In short, we start from bottom to the top in the result above. (1). Five students responded that they took all the subjects, so we put 5 at the center. (2). Eleven responded Biology and Math. So, we should put it in the Biology-Math overlap. However, of the 11 who takes Biology and Math, 5 were also taking English as shown in (1). 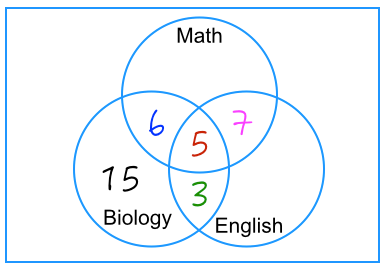 So, there are 11-5 = 6 students in the Math-Biology overlap. (3). Eight responded Biology and English. But of those 8 taking Biology and English, 5 are also taking Math. 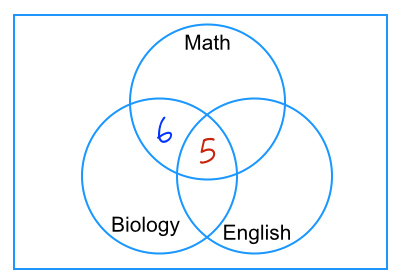 So, there are 8 – 5 = 3 students who are taking Biology and English. 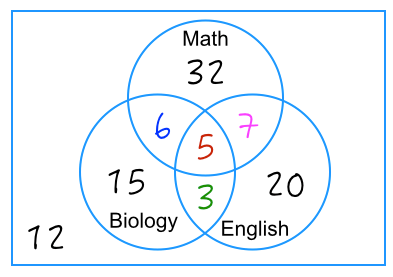 Also, there are 12 students who are taking Math and English, and of those 12, 5 are also taking Biology, so there are 12 – 5 = 7 who are taking Math and English. Now see the next figure to see how the Venn diagram should look like after this step. (4). Next, 29 students responded Biology. But notice that 6, 5, and 3 are already in the Biology circle. So, we subtract those students from 29. That is, 29 – (6 + 5 + 3) = 29 – 14 = 15. So, there are 15 students who take only Biology. 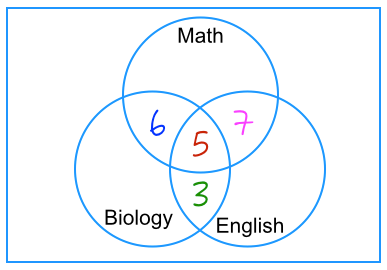 After answering the problems above, the Venn diagram should look like below. Now, to answer the first question, how many students did not take any of the three subjects, recall that there are 100 students who were surveyed. 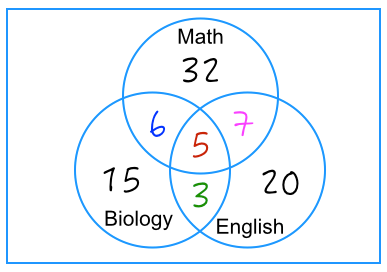 If we add all the numbers in the diagram, 15 + 32 + 20 + 6 + 7 + 3 + 5, the sum is only 88. Therefore, 100 – 88 = 12 students did not take any of the three subjects. For question 2, another way to rephrase it is how many students take only Math, so the answer is 32. Now, that’s it for the Venn Diagram series. We will have practice problems in the next posts.